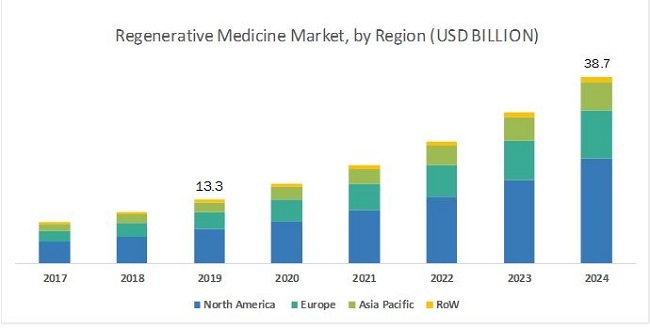 [107 Pages Report] The regenerative medicine market is projected to reach USD 38.7 billion by 2024 from USD 13.3 billion in 2019, at a CAGR of 23.8%. 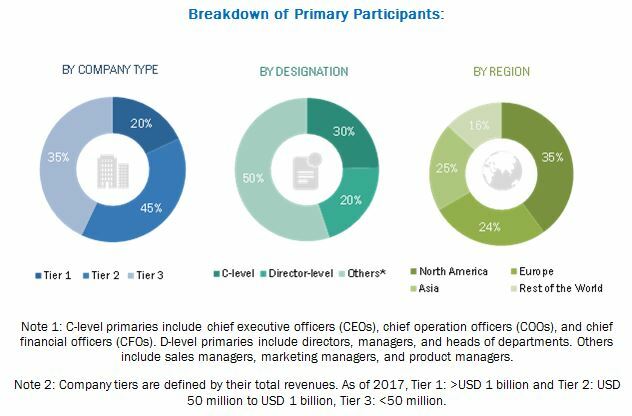 Market growth is largely driven by the rising prevalence of chronic diseases and genetic disorders, growing government investments in regenerative medicine research, and the increasing number of regenerative medicine companies globally. The regenerative medicine market in North America is expected to grow at a rapid pace in the coming years. There has been a tremendous increase in cell-based research activities in the past decade. Increasing research activities in the field of regenerative medicine and growing awareness of personalized medicine have also resulted in the establishment of stem cell banking and tissue engineering. North America has both public and private banks that store a limited number of cells and tissues. In 2018, Novartis received EU approval for its CAR-T cell therapy, Kymriah. In 2017, Integra LifeSciences launched its product, Integra Dermal Regeneration Template Single Layer "Thin" for dermal repair defects reconstruction in a one-step procedure. 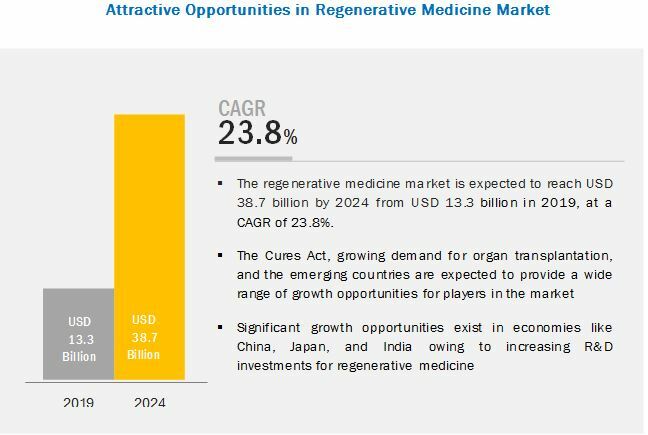 What are the growth opportunities in the regenerative medicine market across major regions in the future? Emerging countries have immense opportunities for the growth and adoption of regenerative medicine products. Will this scenario continue during the next five years? What are the various regenerative medicine types and their respective market shares in the overall market? What are the new trends and advancements in the regenerative medicine market? The study involved four major activities to estimate the current size of the regenerative medicine market. Exhaustive secondary research was done to collect information on the market and its different subsegments. The next step was to validate these findings, assumptions, and sizing with industry experts across the value chain through primary research. Both top-down and bottom-up approaches were employed to estimate the complete market size. Thereafter, market breakdown and data triangulation procedures were used to estimate the market size of the segments and subsegments. After arriving at the overall market size—using the market size estimation processes—the market was split into several segments and subsegments. To complete the overall market engineering process and arrive at the exact statistics of each market segment and sub-segment, the data triangulation and market breakdown procedures were employed, wherever applicable. The data was triangulated by studying various factors and trends from both the demand and supply sides in the regenerative medicine industry. Major 10 players covered, including: Kite Pharma (US), Novartis (Switzerland), Vericel Corporation (US), Integra LifeSciences (US), Wright Medical (US), MiMedx (US), Osiris Therapeutics (US), Stryker Corporation (US), and Spark Therapeutics (US).